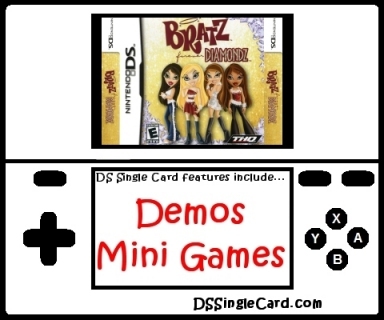 The basic setup of Bratz: Forever Diamondz isn't too flawed. It does take a rather long time to download, especially considering how little the offering is. The game also splits the games into separate downloads when everything should (presumably) be able to fit together in a single download session. The first step, entering "Mini Games", is self explanatory, as is the next step - selecting "DS Download Play" - but then "Top Trumps" is separate from the other games. Not only does it download separately, but to the other games you have to select "Mini Games" again. The game doesn't even tell you what the other mini games are until AFTER they've been downloaded. There is plenty of screen space left, why not just list them? Rodeo Run: The controls are very difficult to maneuver. The horse doesn't jump when you press the button, but rather a couple of steps later. While you can get used to this, why do the gates and the bushes - depicted as having very similar, if not identical, heights - not require you to jump from the same distance back? The gates are MUCH easier to jump, but there's no apparent reason why. Top Trumps: The areas you're supposed to tap are not very large and are right up against each other. The words look almost blurred (not that they really make a difference like the numbers do). The vast majority of the screen goes unused. Each character's stats semm to change almost randomly even though the name of the card doesn't change. Western Dance: This particular game, unlike the others, is very easy to use. So easy, in fact, that there is absolutely no challenge to it. You could easily play this game while having a conversation and watching television and still not miss a tap in the extremely large areas. Bratz: Forever Diamonds's graphics are fine, theout the animations are sketchy. Even taking into account that the look is intentionally cartoony, the animations (especially in Western Dance) seem like the programmers creating the dance didn't know exactly where the floor would be. The audio wasn't damaging, but it wasn't in any way helpful or beneficial. I played each mini game a couple times with the sound off and it didn't change anything. There were no features to speak of for each of the three mini games, aside from the option to play Top Trumps solo or vs an opponent, but there really weren't any options necessary besides maybe a difficulty selection. Brief disclaimer: I only review the Single-Card Download features of games. These reviews in no way reflect the quality or content of the main, single-player gaming experience(s). To be honest, going into this review, I wasn't expecting much. The game was created as a tie-in to a direct-to-video movie and a line of toys. While this is not the type of game I have on my wish list, I didn't let that affect my judgement in this review. The issues I have with this game have nothing whatsoever to do with the Bratz theme of the game. The games were flimsy in quality, assuming there was any there to begin with. Top Trumps is a game of tapping a category name in the hopes that the number next to it is higher that the number for the same category on a hidden card. Why not just tap the number, which was bigger and easier to read? Why would anyone who understands the concept of "Which number is the biggest?" ever tap anything but the highest value? Rodeo Run, which is not even a run - it's a ride (still works for alliteration, people) - adds complexity to the main focus... jumping. Why doesn't the horse jump when you push the button? Why are the bushed so much more difficulty to jump than the equally-tall gates? Western Dance comes off as extremely last minute rip-off of Osu! Tatakae! Ouendan! (the Japanese version of Elite Beat Agents was release prior to Bratz: Forever Diamondz). If a game poses no challenge whatsoever, it also provides for no interest. After tapping the same, simple pattern repeatedly, you get to watch your character on screen dance for close to twice as long as you tapped for - all the while, you're doing nothing. Why? I didn't spend any time at all on the main game (like I said, it's not my style), but I just hope that it's better than the Single-Card Download offerings. I mean, seriously... can it even get any worse? Combine all of the mini games into a single download. Add difficulty selection for each game. Program for quality and not quantity; one good mini game is far better than three poor non-attempts.